Fifty-three contestants walked the walk on stage at Boardwalk Hall when the 88th “Miss America Pageant” returned to Atlantic City in September. 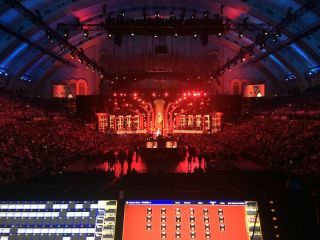 Two dozen Clay Paky Sharpy Wash fixtures and a complement of grandMA2 consoles controlling lighting and media were on hand from Atomic Lighting in Lititz, Pennsylvania for the gala telecast on ABC Television. A.C.T Lighting is the exclusive distributor of both brands in North America. Allen Branton was the lighting designer for the “Miss America Pageant” with Felix Peralta and Kevin Lawson the lighting directors and Laura Frank the screens producer and media programmer. With large groups on stage at times Lawson was challenged to not just bathe the scene with light. “I wanted to shape it enough to make the girls look great and be individually visible,” he explains. One full grandMA2 console and two grandMA2 lights with fader wing were deployed for lighting. The “Miss America Pageant” was one of the first shows on which the team used 3.0 software. “We enjoyed its many new features,” Peralta reports. Laura Frank, who is the principal of Minneapolis-based Luminous FX, utilized two full-size grandMA2 consoles running servers to screens, which covered the set. Media content helped establish competition segments and “tie the show together,” she says. “The screens also gave different live views, different angles of the girls” as Frank pulled up the cameras she needed to spotlight the contestants – which one would win the crown?